“The MONARCH 7i VR is one of the most exciting new products of Nikon’s recent releases. Not only does this make it easier for hunters and shooters to range objects at long distances, we are able to offer it at a price point that doesn’t break the bank. We strive to make practical advances in hunting optics and this is just the beginning of some exciting new things hunters can expect from Nikon,” said Randy Garrison, Associate General Manager at Nikon Sport Optics. 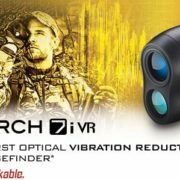 Another feature of the MONARCH 7i VR Laser Rangefinder is the ability to switch between First Target Priority Mode (provides reading of the closest target among a group) or Distant Target Priority Mode (provides reading of the farthest target among a group). Whether your subject is in front of or behind a patch of brush, this setting can greatly improve your ability to get the most accurate reading depending on the situation. For more information on Nikon’s full line of Riflescopes, Binoculars, Fieldscopes and Laser Rangefinders, please contact: Nikon Sport Optics, 1300 Walt Whitman Rd., Melville, NY 11747-3064, or call 1-800-645-6687.www.nikonsportoptics.com.